For most, dental flossing seems to be just another oral health regimen. Along with regular tooth brushing, it keeps your teeth and gums clean and healthy. Then again, experts now reiterate that the benefits of flossing daily can also go beyond just cleaning out those excess food particles. Flossing can actually help you achieve a much brighter smile. Yes, there are a number of modern approaches when it comes to Teeth Whitening and Cosmetic Dentistry. Then again, experts say that using the dental floss is equally beneficial to your quest to have that sparkling white smile. The main way that dental flossing aids in enhancing the appearance of your teeth is by removing plaque and tartar. By flossing daily, you prevent the formation of these unwanted buildups and thus, protect your teeth from staining and discolouration. The presence of plaque and tartar make your teeth more prone to staining as pigments and more food particles can easily adhere to them. As such, even if you get regular Teeth Whitening treatments, the results would likely be unnoticeable if you do not floss and brush your teeth as recommended. 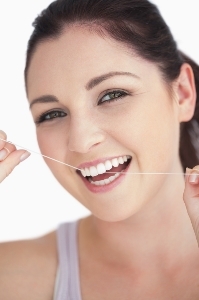 Daily flossing does not only uphold the well-being of your teeth and gums. It is also essential in enhancing the beauty and elegance of your smile. Making adjustments on your dental care routine easily goes hand in hand with improvements on the appearance of your teeth. Having clean and healthy teeth and gums will significantly boost the beauty of your smile. That is why if you are considering to have Teeth Whitening treatments, you should also see to it that you fully committed to observing proper oral hygiene. Else, your investment in Cosmetic Dentistry will be a let-down as the results will not last long enough. as such, to be entirely certain about the longevity of your beautiful smile, see to it that you become more responsible when it comes to the wellness of your teeth gums, and mouth. Strive to achieve the smile that you have always wanted. Start by consulting your reliable dental care partners here at Bondi Dental. With a local community presence of over 30 years, Bondi Dental remains committed to providing the local Bondi community and its surrounding regions with the very best dental solutions that modern dentistry has to offer. Call us today on (02) 9365 7187 or simply book an appointment online to claim your FREE Dental Consultation. Here at Bondi Dental, we let your smile shine.